There are many different types of door locks, from simple indoor privacy locks to the most secure exterior locks. 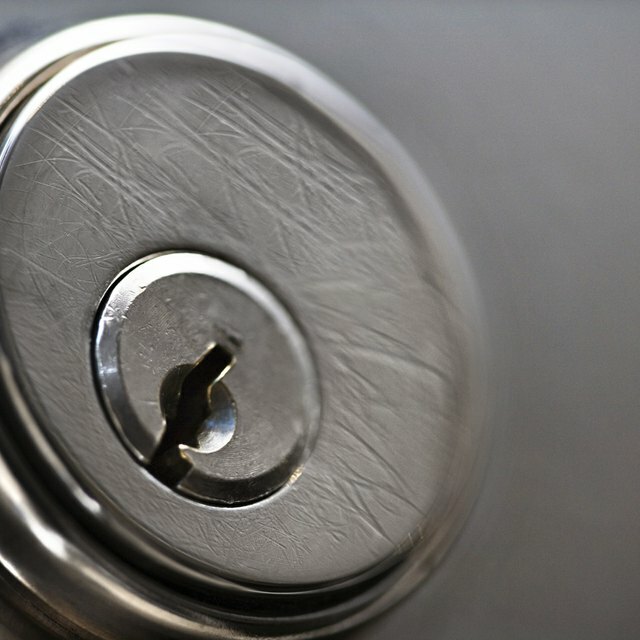 When deciding on doorknobs and locks, you need to determine your security needs and whether certain types of door locks are worth the extra expense. A review of possibilities at a home improvement store can help. A privacy door lock is an interior type and does not provide any real security. This doorknob, or lever, has a lock button on the inside but no key function on the outside. A narrow slot on the outside allows for a thin object to be inserted, which can push out the lock button if necessary. A standard exterior door lock includes a doorknob that locks and unlocks from the inside with a button turned or pressed, and locks and unlocks from the outside with a key. Higher-level security can be achieved with a deadbolt that operates with a key from the outside, and a turning knob on the inside. The bolt moves from the doorknob apparatus into a slot in the frame. A surface-mount deadbolt is another option, with a D-shaped or rectangular housing mounted on the back of the door. Keyless door locks also are available for advanced security as well as convenience. These involve entering a code to unlock the door.